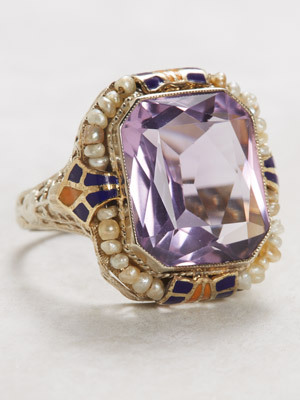 Bead pearls and blue and orange enameling add striking contrast to this vintage ring's amethyst. 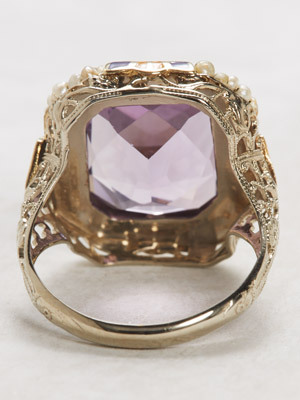 Delicate natural pearl threads capture this vintage ring's amethyst in their alluring web. The beaded pearl filament that trims the violet gemstone is accented at its cardinal points with unexpected bursts of colorful enamel. 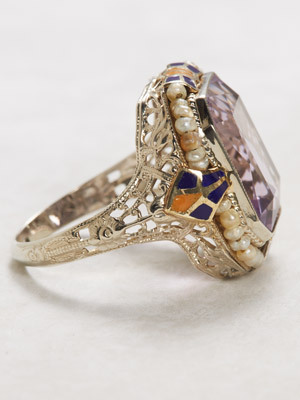 The filigree band of this ring is intricately pierced along the bezel and down its shoulders. Details: Vintage. Circa 1930 or later. 14k white gold. 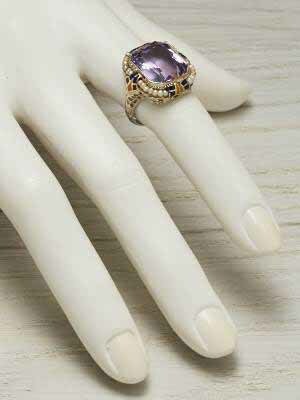 Emerald faceted mixed cut amethyst; 8.17 carats. Natural bead pearls. Special characteristics The pearls are natural and are strung on wire. Blue and orange enamel adorns the cardinal points. Other pearl info The pearls are natural. 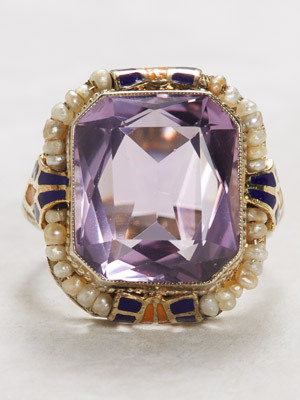 Other ring info The pearls have medium luster and a textured to smooth complexion with poor roundness and fair matching.